John Dewey, the American philosopher, psychologist, and educational reformer whose ideas have been influential in education and social reform once said, "If we teach today, like we taught yesterday, we rob our children of tomorrow." When one considers the blistering pace at which technology is evolving, the exponential growth of knowledge as a free commodity, and Common Core State Standard's focus on applying skills, concepts, and understandings, this statement is more relevant now than ever. In previous a previous blog post, "Technology Integration: How Do You Know if You are "Doing it Right?" we examined a helpful resource for teachers called the Technology Integration Matrix (TIM). The TIM serves as a guide to evaluate, and identify whether the use of technology is teacher or student centered. The student centered use of technology is the ultimate goal as it targets higher order technology skills in addition to empowering students to choose the appropriate technology "tool" to accomplish a task, solve a problem, or make a decision. 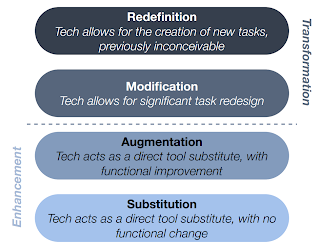 In this article, we're going to explore the SAMR Model. Dr. Ruben Puentedura, is the creator of the SAMR model for selecting, using, and evaluating technology in education, which currently guides the work of the Maine Learning Technology Initiative, as well as projects in Vermont and Sweden. 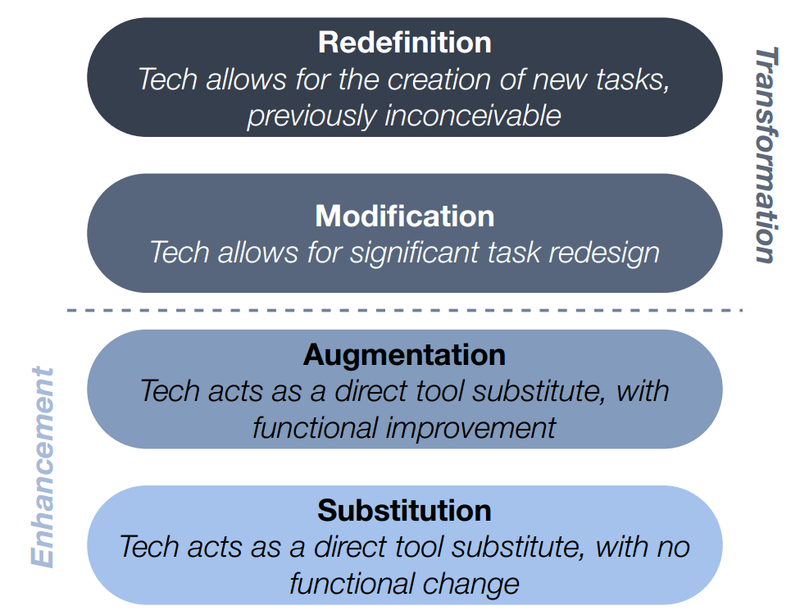 According to Technology Is Learning (TIS), "the Substitution Augmentation Modification Redefinition Model (SAMR) offers a method of seeing how computer technology might impact teaching and learning. It also shows a progression that adopters of educational technology often follow as they progress through teaching and learning with technology." The TIS website goes on to say that "while one might argue over whether an activity can be defined as one level or another, the important concept to grasp here is the level of student engagement. One might well measure progression along these levels by looking at who is asking the important questions. As one moves along the continuum, computer technology becomes more important in the classroom but at the same time becomes more invisibly woven into the demands of good teaching and learning." 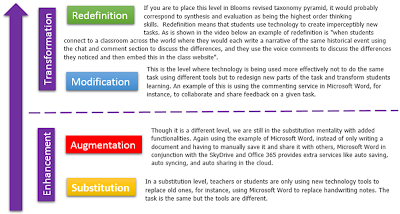 Click on the image below to read a practical application of the SAMR Model. It's suggested that you read from the bottom of the chart up to the top of the chart. 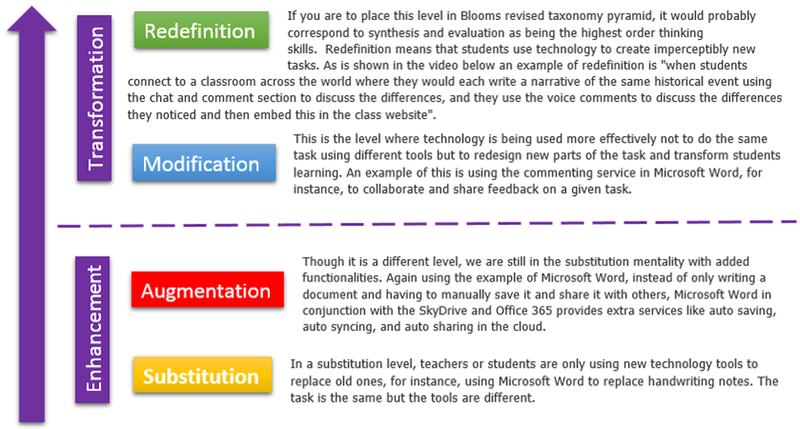 In other words, moving from Substitution, the lowest level of technology integration on the continuum, to Redefinition, or the highest level of technology integration. Watch the video below for a further look at the SAMR model. In the 2nd year of our 1:1 laptop initiative at JTHS, and the SAMR Model is a straight forward guide to help teachers move from simply doing old things in new ways, to invisibly weaving technology into the classroom to redefine and transform teaching and learning. As Chris Lehmann, the founding principal of the Science Leadership Academy in Philadelphia says, "Technology should be like oxygen: ubiquitous, necessary and invisible." Our district's mission statement asserts, "the integration of technology is essential to motivating and engaging students in rigorous and relevant lessons. 1:1 technology provides anytime/anywhere learning and opens the doors to the critical thinking and problem solving skills that students need to compete and contribute in our global society." Resources such as the Technology Integration Matrix (TIM) and the SAMR Model can be counted on to realize the goals set forth by the district. For more information on the topics discussed in this article, contact an instructional technologist about professional development opportunities at your campus. Puentedura, Rueben R. "Hippasus." Hippasus. Dr. Ruben R. Puentedura, n.d. Web. 16 July 2013. "SAMR Model - Technology Is Learning." SAMR Model - Technology Is Learning. N.p., n.d. Web. 11 July 2013. "SAMR Model Explained for Teachers ~ Educational Technology and Mobile Learning. "SAMR Model Explained for Teachers ~ Educational Technology and Mobile Learning. N.p., n.d. Web. 11 July 2013. "SAMR in 120 Seconds." YouTube. YouTube, 30 May 2013. Web. 11 July 2013. Wagner, Tony. "“Graduating All Students Innovation Ready”." Tony Wagner. Tony Wagner, 14 Aug. 2012. Web. 16 July 2013.